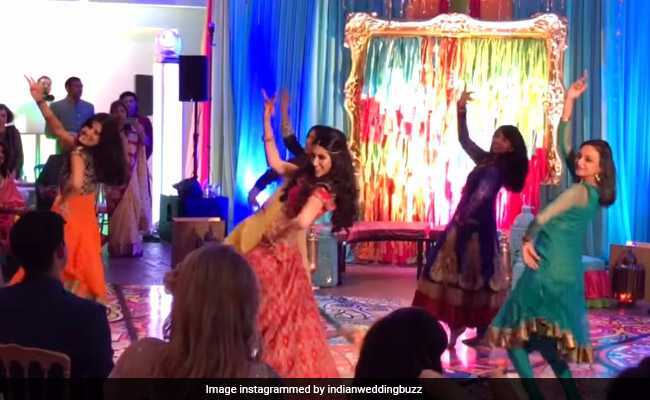 The clip shows bride Natasha Arora performing with her friends at her wedding. If you need any more proof of just how fun and exciting big fat Indian weddings can be, here's what you need to see. A video of a bride performing at her sangeet ceremony in Texas, US, has many on Instagram completely hooked. The short clip shows the bride channeling her inner desi girl as she dances to Sonam Kapoor and Salman Khan's song Prem Ratan Dhan Payo. The video has collected over one lakh views within a day of being posted. The clip is actually from a video shared on YouTube back in February. It shows the bride, Natasha Arora, former Miss India USA (2010), performing with her friends at her wedding. The original video is over six minutes long and shows Ms Arora dancing to a mix of Bollywood numbers including Mera Piya Ghar Aaya, Madhuri Dixit's famous dance number from Yaraana and Radha from Student of The Year. She ends the performance by dancing to Happy New Year's Lovely. This bride's moves and energy seem hard to match. However, chances are, you'll want to get up and dance with her. "Ideas for my wedding," says one Instagram user. "So nice... Lovely," says another. Tell us what you think of the performance in the comments section below.